The popularity of conservatories as a means of improving the beauty, functionality and value of our homes continues to grow every year. 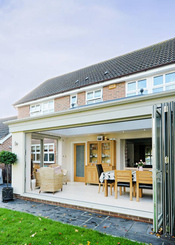 But in particular, there has been a growing trend in recent years for homeowners to opt for orangeries, rather than the more traditional conservatory. And it really isn’t difficult to see why. 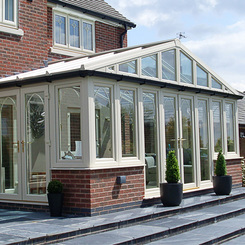 With their elegant high glass roofs, large windows, perimeter ceilings and a greater use of stonework, masonry or timber; they create the light and spacious environment of a traditional conservatory, but with a more elegant and contemporary feel, improved thermal efficiency, and a greater feeling of privacy. 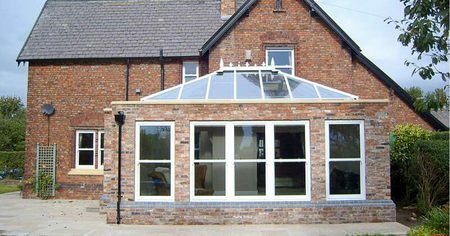 In short, an orangery can offer all the advantages of a traditional conservatory, but with the feel of a “real” living room or complete house extension. 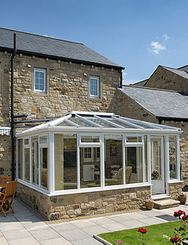 However, buying and constructing an orangery will typically cost significantly more than an equivalent conservatory, and this extra cost can be a stumbling block for many homeowners. 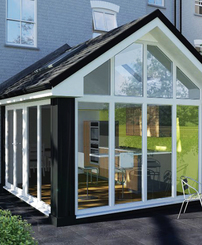 We are delighted to offer customers the option of an Ultraframe LivInRoom Orangery. This offers customers the chance to enjoy the elegant, light and comfortable living space that an orangery can provide, but at a much more affordable price range. Rather than the expense building an orangery from scratch from the ground up, this innovative solution allows you to convert a brand new or existing traditional conservatory into a luxurious orangery / house extension, using a combination of Ultraframe windows, brick piers, sliding doors and cornices. Ultraframe windows and roofs allow you to easily control ventilation and keep your LivinRoom Orangery at a pleasant comfortable temperature all year round. Furthermore, customers have the peace-of-mind that Ultraframe rigorously test their fittings to withstand the very harshest weather conditions. So, if you are looking for an affordable orangery, a premium quality conservatory, or an alternative to the expense of a full house extension; we would definitely recommend looking at the LivinRoom Orangery. It could well be the perfect solution for you.